Francis Durbridge (1912-1998) was a prolific English writer of novel, plays, radio plays and television screenplays. He worked mostly in the crime genre although occasionally with a few spy thriller elements as well. 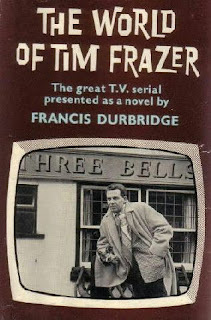 The World of Tim Frazer was a very successful 1960-61 television serial which, sadly, has not survived. We do however have his 1962 novel based on that serial. The World of Tim Frazer is a spy thriller. It belongs to the Reluctant Spy sub-genre, in which purely by accident a very ordinary man gets mixed up in the murky world of espionage. This is a sub-genre that was perfected by Eric Ambler back in the 1930s. By 1962 it was falling out of favour, with professional spies like James Bond and Matt Helm ruling the literary roost. The Reluctant Spy format suits Durbridge’s style and in fact his straightforward detective stories more often than not feature heroes who have stumbled unwittingly into a world of crime. Tim Frazer is a partner in an engineering film, or at least he was before the firm went belly up. The company’s failure can be attributed mostly to the recklessness and dishonest of Frazer’s partner Harry Denston. Frazer and Denston have however been friends for a long time and Frazer was well aware of Harry’s character flaws and he probably should have had enough sense not to go into business with him. Now Harry has disappeared. That’s not unusual. Harry often has reason to make himself scarce for a while. What is unusual is that Tim Frazer has been asked to find Harry. He has been asked by a man named Ross who works for a government department. He cannot give any details about this department apart from the fact that it was access to large amounts of money about which the British taxpayer knows nothing and it has rather sweeping powers. In fact it seems to have more or less unlimited powers. It’s not MI5 but it’s obviously some shadowy counter-intelligence agency. And they’ve offered Tim Frazer a very generous salary. Tim Frazer is now a spy, or perhaps it would be more accurate to say he is now a spy-catcher. He has absolutely no training or expertise but he does know Harry Denston’s habits extremely well and this mysterious department has certain reasons for not wanting to use one of their own people on this case. 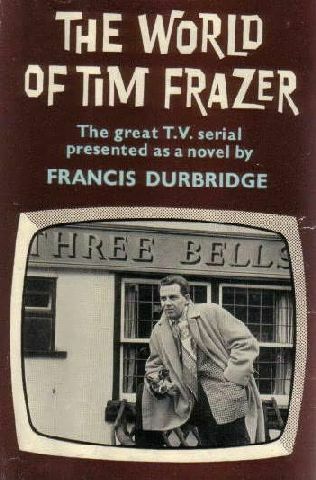 Frazer does have a few leads that might lead him to Harry. He knows that for some reason Harry’s car is terribly important. He knows that the seaside town of Henton, a drowned Russian sailor and a little girl named Anya are important. And the frigate North Star, which foundered in 1794, is extremely important. Tim Frazer may be a rank amateur but he shows a certain flair for the game of espionage. He’s intelligent and he’s naturally suspicious of people and their motives. He’s good at spotting lies and he’s also quite good at bluffing people. There are a lot of lies to untangle but Frazer is patient and determined. He is just a little shocked when he has to confront the fact that this is a game in which people can get badly hurt or even killed but he recovers his equilibrium quickly enough. And he discovers that killing people isn’t all that difficult. He doesn’t like it but he can do it if he has to. This is a low-key spy thriller. The world of Tim Frazer is a long way from the world of James Bond. There are no gadgets. There are no glamorous lady spies throwing themselves at him. There’s not a great deal of action. There is some violence. It’s not graphic violence but when it occurs it occurs suddenly and with a certain casual brutality. Durbridge throws in enough plot twists to keep things interesting. Tim Frazer is, initially at least, working completely in the dark. He hasn’t been told why it is so vital that Harry should be found. He has been given no indication whatsoever as to exactly what Harry may have done. He doesn’t know who the bad guys are. He doesn’t know who he can trust. He doesn’t have any idea where Harry might have gone to. The reader knows as much as Frazer knows, which is virtually nothing. There’s a mystery to be unravelled but the mystery is not just the identity of the criminal but also the nature of the crime. While The World of Tim Frazer has none of the glamour of Bond it also lacks the nihilism and pessimism that became increasingly prevalent in spy fiction during the 60s. Even in 1962 it must have had a slightly old-fashioned feel but on the whole it works and it’s enjoyable. Recommended. 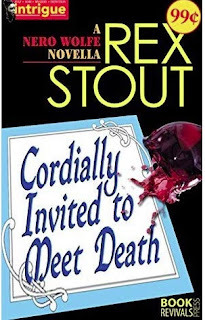 Cordially Invited to Meet Death is a 1942 Nero Wolfe novella by Rex Stout, published as a double-header with Black Orchids. Bess Huddleston organises parties. She organises parties for very very rich people and she gets paid an enormous amount of money for offering this service. Now someone is sending letters that could ruin her business. Nero Wolfe isn’t particularly interested in the case but the fee being offered is very substantial, and Nero Wolfe is always very interested in substantial fees. Nobody really expected that it would end in murder. The circumstances limit the possible suspects to five. There’s Miss Huddleston’s brother Daniel (whose bizarre chemical experiments she finances), her virtually unemployable nephew Larry, her secretary Maryella Timms, her party-organising chief assistant Janet Nicholls and a certain Dr Brady. The chimpanzee is almost certainly innocent and the bears have an alibi. The centrepiece of this novella is the unusual murder method. Whether it would actually work in practice is perhaps open to debate but it certainly sounds chillingly plausible. And very difficult indeed to prove. Cordially Invited to Meet Death is also notable as an example of Wolfe’s stubbornness. Inspector Cramer should know by know that trying to bully Wolfe just irritates him without achieving anything. It can irritate Wolfe so much that it inspires him to solve a case that he would otherwise not trouble himself over. On balance it’s probably just as well Archie didn’t take his gun with him on his first visit to the Huddleston estate. There was no reason to shoot the chimpanzee. He was just playing. And the alligators were just being alligators. Incidentally, those famous black orchids make an appearance in this story. This story has a pretty decent plot. It’s very fairly clued but there’s enough misdirection to keep us guessing (well it managed to keep me guessing anyway). Wolfe’s solution is satisfying. Wolfe is in pretty good form. There’s a fairly colourful cast of suspects. There are some eccentric and even bizarre elements. And had he not taken the case Wolfe would never have discovered the secret of a really successful corned beef hash. A case that has a genuine gastronomic payoff is always a satisfactory case. Cordially Invited to Meet Death is a most enjoyable tale. Highly recommended. And the edition that includes both this novella and the also excellent Black Orchids is a must-buy for Wolfe fans. Gerry Anderson’s 1975-77 science fiction television series Space: 1999 spawned quite a lot of spin-off merchandising. This included a whole series of novelisations, but more interestingly it also included five original novels. 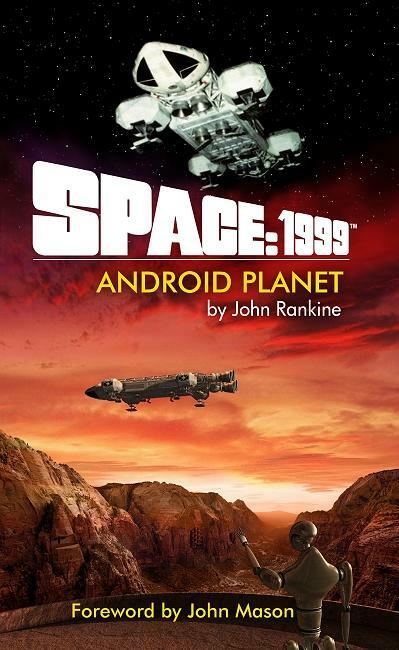 One of these original novels was John Rankine’s Android Planet, which was originally published in 1976 and it's a pretty decent science fiction tale. Here’s the link to my full review of Android Planet at Cult TV Lounge. Harold Lamb (1892-1962) was an historian and screenwriter as well as a prolific writer of adventure novels and short stories. He wrote for various magazines but his best known stories appeared in Adventure magazine which was a pulp magazine, but a rather up-market one. Being also a successful popular historian gave Lamb a slightly higher degree of literary respectability than most pulp writers. Bison Books have issued virtually all of Lamb’s stories in a series of paperback editions. The paperbacks are rather generous - most include one or two short novels as well as a dozen or so short stories and novellas so they’re pretty solid value. 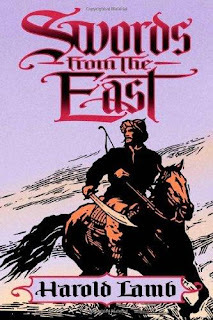 Swords from the East includes his tales of Mongols, Tatars and other Asiatic peoples. Lamb had a considerable amount of sympathy for both European and non-European cultures. This collection even includes a very favourable view of Genghis Khan. The Gate in the Sky is a simple little tale of a gentle reindeer herder. He loves his reindeer so much that when he needs meat he hunts other game but will not harm his reindeer. Now someone has stolen his herd. He is outnumbered and has only a bow and is up against men with guns but he must get his herd back. Perhaps the gate in the sky will open for him. The Wolf-Chaser is the tale of a Christian knight a long long way from home. In 1660 Hugo of Hainault finds himself in the wilds of Tartary, in search of his brother Paul. Paul is a priest. Hugo is really not much of a Christian and he didn’t get on all that well with his brother but a brother is still a brother and Hugo has a stubborn streak. Having set himself to find Paul that’s what he is going to do. He finds himself in the middle of a war. It is not his quarrel, he is not a man who would normally concern himself with conflicts not involving gentlemen, and he regards the Tatars as savages. But he does have that stubborn streak and he does get involved. The Three Palladins is a short novel. A young Chinese prince discovers that he has an enemy at court. A very deadly enemy. It is only by the merest chance that Mingan escapes with his life. Beyond the Great Wall he encounters a young Mongol prince named Temujin (destined to become rather better known as Genghis Khan). This is a complex story of friendships and loyalties. It’s also a story about heroes but these are heroes who are more than just mighty warriors. It’s an epic tale but the focus is on the men who drive great events rather than on the events themselves. An excellent tale. The House of the Strongest is an odd little tale of a Mongol whose immense strength wins him wealth and a beautiful wife, but not his wife’s respect. At least not at first. Sleeping Lion is a story that unfortunately has not survived in a complete form. It’s a pity since it’s an interesting tale of Marco Polo at the court of Kublai Khan, and of a fabulous ruby and of a young concubine. Not to mention an unscrupulous drunken astrologer. The Road of the Giants is another short novel. In 1771 Scottish cartographer Captain Minard Billings is employed to make a map of the Tatar steppe. He is caught up in a revolt of the Tatars. Not an ordinary revolt though - rather than taking up arms against their Russian overlords the tribes have decided simply to leave, to return to their ancestral homelands far to the east. This will not please the Russian empress, now deprived of the taxes paid by the tribes and of their services in war against the Turks. It will also cause difficulties for the tribes since those ancestral homelands are now occupied by others. It could become a death march. Captain Billings is an unwilling participant in the march, there is a major complication in the form of the clever but dangerous girl Nadesha and there’s also the fact the son of the khan and the tribe’s Tibetan guide and advisor both very much want him dead. This is another story of unlikely friendships and surprising and complicated loyalties. And it’s another story about the complex nature of heroism. These are the things that Lamb writes about exceptionally well. Azadi’s Jest concerns a woman of the sultan’s harem and a cossack prisoner who is being put to the torture. The woman thinks the cossack has cast a spell on her. Perhaps they have in fact cast spells on each other, love being a kind of spell. But both will face extreme danger as a result. A good little story. The Net is a bit like The Gate in the Sky, a story of vengeance coming from an unexpected quarter. A young girl, the niece of a blind fisherman, is carried off by traders. They think they are safe from retribution but they are wrong. A good simple little story. The Book of the Tiger, in two parts (The Warrior and The Emperor) is the fascinating true story of Babur, the first of the Moghul emperors of India, and is based on Babur’s own autobiography. At times ruthless, at times extraordinarily reckless, Babur comes across as a rather attractive character, a leader with genuine substance. And a leader to whom loyalty was important (loyalty and friendship being key themes in Lamb’s fiction). Swords from the East provides plenty of rousing adventure combined with a surprising degree of psychological insight and subtlety. Highly recommended. Swords from the West and Swords from the Desert, also from Bison Books, are also highly recommended.